Gel timers, wire stirrers, aluminum cups, paper cups, Hot Pots, StablTemp Hot Pots, O-ring cup holder, gelation timers, rotational gel timers. Standard model is used for testing material at ambient temperature. 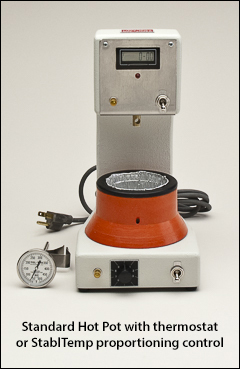 Two Hot Pot gel timers are available for operating temperatures between 125–350°F (52–177°C). All 3 models are available for either 110 or 220 volt wiring. Determines gel time easily and accurately. For resinous plastics, adhesives, drying oils, paints, and two component elastomers at ambient temperatures. A low torque synchronous motor rotates a wire stirrer in the catalyzed resin or elastomer. As gelation occurs, drag exceeds torque and the motor stalls, signaling an electric circuit that stops the clock and activates a flashing lamp. Includes a digital readout, a few paper cups, wire stirrers, and extra O-ring. 167 hours maximum record time, 1 second minimum time interval, 250 watt, 20 RPM stir speed, and ±2% accuracy. 110 volt 60 Hz. 220 volt for export, 50 Hz. Determine gel time at temperatures up to 350°F. The same ease and accuracy of the standard gel timer, but with the addition of a temperature controlled Teflon lined pot. Two different Hot Pot models are available: Standard Hot Pot and StablTemp™ Hot Pot. Both have digital readouts, and include a few aluminum cups and wire stirrers. 167 hours maximum record time, 1 second minimum time interval, 250 watt, 20 RPM stir speed, and ±2% accuracy. 110 volt 60 Hz. 220 volt for export, 50 Hz. 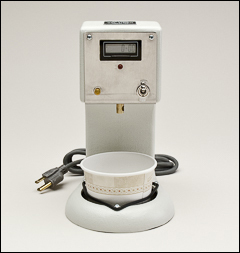 Standard Hot Pots use a simple rheostat temperature controller and have an operating temperature range of 125°–350°F. StablTemp Hot Pots use an electronic proportioning control that regulates the set temperature with virtually no drift or variation, and have an operating temperature range of 125°–350°F. 8 ounce paper cups are used in all the Standard gel timers. The minimum order quantity is one sleeve. We show the price of each cup, just so it's easier to see how much less you pay if you buy a full case. But because of rounding to the penny, the 5% discount for 5 case orders isn't accurately listed when we do it this way. Same wire stirrers are used in any of the Standard or Hot Pot gel timers listed above. Aluminum cups are used in all the different Hot Pot gel timers. In these items, the unit quantity is the minimum order quantity.